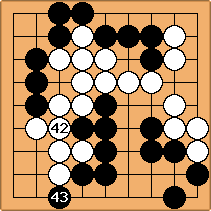 White wins 4 points, komi 7. Becoming a shodan is difficult. Going beyond that is even more difficult. I played against 30 players, beat 23 of them, including six 3 dan players and five 2 dan players. 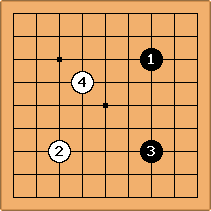 All the games, called "Road to 2 Dan," were annotated and might be useful for kyu players. They are accompanying materials of The Art of 9x9 Go. This is the first of the 30 games along the road to 2 dan. I was White, 1 dan. 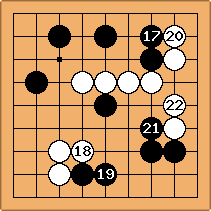 is a traditional opening of kyu players who care the corner. is a balance reply. confirms Black is a territory-oriented player. His strategy is to well occupy the two corners before attacking me. a is a balance reply, but I want to test his attack skill, by playing a higher move that welcomes his invasion. is what I mean. 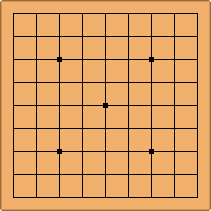 It creates enough space for Black to live at the top left corner. I invite Black to attack that region. Note: During a game we can never know for certain what the opponent is going to do. We must make the best estimate about his next move--the move that would be his best effort: most valuable to him and most dangerous to us. Black didn't attack. is a poor move in my view, as it is neither most valuable to Black nor most dangerous to White. Black is too much careful about the unity of his army. He didn't dare to invade my camp and fight like a brave knight. Art: Not taking any risk is a good strategy, but it is the biggest risk when there is a chance. Weak players usually regard obscure opportunities as risk. The idea behind is to attack both . 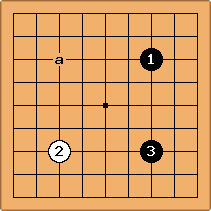 Any extension from any will force White to move and attack the other . This is my favorite reply to the skipping diagonal moves. Black wants to claim the top righ corner. He also plans to either move westward from or cut White at a. Connecting at a is priority for White because the cutting at here, if allowed, is big. After , Black well occupy the northern zone, and has the potential to map out the route that links , and will have a chance to win. I must kill the plan now, before it is too late. is simple but effective. It forms a great wall that blocks the upper and the lower black groups. 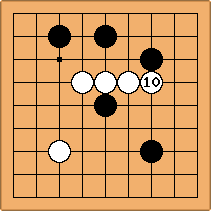 Black thinks the lower group is weaker than the upper one, so he needs to help it first. White seems solid and all the soldiers are working together to surround the weak black group. After , White is deciding whether to jump at a or to block at b. The jumping seems big but it leaves weak and prone to be attacked. Uncertainty would occur around the south west region and cause epidemic that is harder to cure. 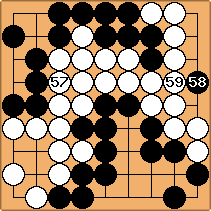 So, I block with , and Black invades with big . 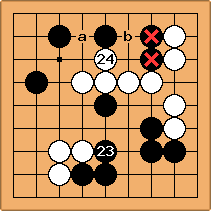 White plans to compress the black south group, and to put it into death if Black's defense is not well done. is the first missile to complete the mission. See how Black manage to survive. Any mistake will bring doom to this federal. However, White's attack will not be much powerful because he has to fight at both front and back sides of the army. is a must. 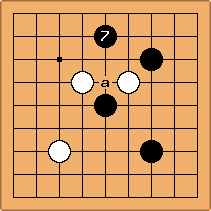 White has to defense the back side with . 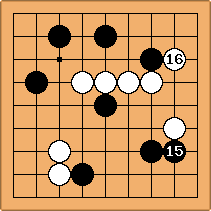 White needs powerful defense that is not negligible so that he can continue to attack at the front side. White keep attacking until . Black hits back with and has a chance to attack further. is overplayed. The lower Black group is already hard to kill; Black should play somewhere else bigger. White has to invade Black territory anywhere big. Begin with . White plans to treat at a and then b to kill . Black knows White's strategy; he solves the problem with . White see a is another non-negligible move, capable of cutting Black into pieces. White see a is another forceful move. Black wants to kill but b is more urgent if White will treat at a really. Thing goes as described. Now it's time for White to defend at which forcefully treats to capture at . This is a very good defense. See what will happen if is ignored. 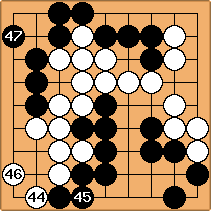 So, Black defends with , and White has a chance to initiate an attack. Sliding at is interesting because it is initiative. Now White eyes for another initiative. is not good. 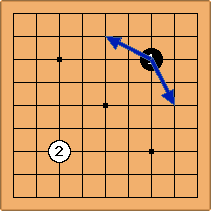 It allows Black to take a monkey jump to . Luckily, Black didn't see the opportunity. He extends with instead of jumping to . This is a big mistake Black made. So, White happily blocks with . Then, Black peeps with . 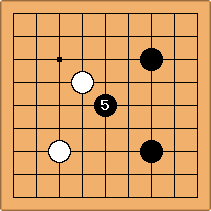 White can either connect at or but is better as it also attacks . So, appears at . Black loads the gun with and aims at , where White needs to shield. is sente and further destroying White's territory while strengthening itself. This is called "Attack is the best defense." is another overplay Black made again. His weakness is a limited ability to see clearly whether a group already survives. is probably a major cause of Black's failure during the end game. 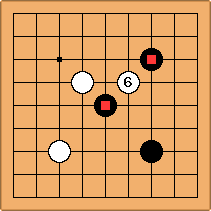 End games begin when both players are fighting around the edge, and now it is. White takes initiative with . is a coward move. The top black group is already immortal, so is better. White pushes with and shuts the gate with . The game should end at move 56, when Black passes. But to prevent the result from GoQuest's incorrect counting, White fills the empty space with and hits with for fun. White wins by 4.